Read the soft-dirty bits on the PTEs to see which pages got written to. Not too tricky, so how about using this neat feature? While on rather long and dull flight over the Atlantic back in August I hacked up a very crude ncurses based tool to continually check the PTEs of a given process and display the soft/dirty activity in real time. During this Christmas break I picked this code up and re-worked into a more polished tool. One can scroll up/down the memory maps and also select a page and view the contents changing in real time. The tool identifies the type of memory mapping a page belongs to, so one can easily scan through memory looking at pages of memory belonging data, code, heap, stack, anonymous mappings or even swapped out pages. Running it on X, compiz, firefox or thunderbird is quite instructive as one can see a lot of page activity on the large heap allocations. The ability to see pages getting swapped out when memory pressure is high is also rather useful. I may be adding a few more features in the next few weeks, and then getting the tool into Ubuntu and Debian. Unfortunately sudo is required to allow one to dig so intrusively into a running process. For more details on how to use pagemon consult the pagemon man page, or press "h" or "?" while running pagemon. ..and redirecting the output from xxd into a C source and compiling this simple and easy to do. So for large blobs, I personally favour using ld to do the hard work for me since I don't need another tool (such as xxd) and it removes the need to convert a blob into C and then compile this. A new --log-level option that allows one to log test that fail at specified a level or higher, e.g. fwts --log-level high will just show high and critical test failures. 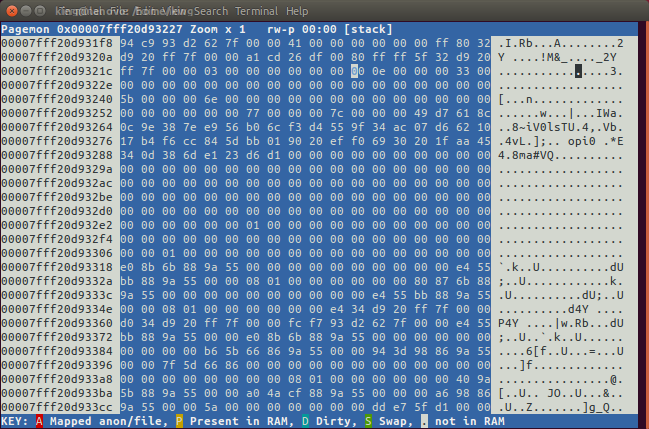 The apcidump table dump pseudo-test is now aligned with the ACPICA table dumping (disassembly) engine. It is also worth mentioning that the UEFI Board of Directors recommends FWTS as the ACPI v5.1 Self-Certification Test (SCT). This is exciting news and we welcome this decision for FWTS to be recognised in this way. We are also very grateful for the community contributions to FWTS, this buy-in from community is appreciated and makes FWTS a better tool to support different architectures and systems. As ever, with new releases, please consult the release notes. During an idle moment while on vacation I was reading the paper "Reliable Two-Dimensional Graphing Methods for Mathematical Formulae with Two Free Variables" by Jeff Tupper and I stumbled upon rather amusing inequality at the end of section 12. In tribute to this most excellent graphing formula, I felt inspired to use the same concept in my Christmas 2015 obfuscated C offering. I cheated a little by also using a Makefile, but I hope this also adds to the magic of the resulting code. 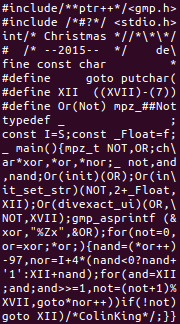 To make the program more fun I thought I'd use a lot of confusion logic operator names in the code and mix in some incorrect Roman numeral constants too. I could have obfuscated the code more and made it smaller, but life is too short. I will leave that as an exercise to the reader.